New releases are here! Check out our new features and enhancements. Now there’s a great way to visualize a donation campaign’s fundraisers and how much they’ve contributed. Fundraisers, or supporters who create a donation site in support of a donation campaign, can be displayed in a pie chart on the main page. For those campaigns that leverage the spirit of competition, this front-and-center statistical graphic indicates those who are leading in donations. Users can also hover over the pie chart to see the fundraiser associated with each slice. Learn more: How to Add the Fundraisers Pie Chart. Take advantage of another channel to promote your donation campaign. Organizations that have a custom mobile number can now associate keywords with links to a donation campaign. When users SMS text a keyword associated with the campaign to your group’s custom mobile number, they will automatically receive a link to your associated donation campaign. Clicking the link will take a user directly to the mobile-friendly donation site, wherein they can donate online from any device. You can link multiple keywords in the instance that you’ve set up fundraiser or supporter pages. Anyone who misspells a keyword will still automatically receive a link to the main donation campaign. This feature is currently available to those on Pro, Premium, or Enterprise plans and requires setup by our in-house support team. Please email support@memberplanet.com for more information. Admins can utilize the profile update request to email members to update their profiles – and members can make updates using a tokenized link in the email without having to log in. Admins can then check whether members updated their profile and further target or take action for those who did not. The email history includes how many people the profile update request was sent to, whether the email was delivered and opened, and whether or not the profile was updated from the link. If a member did update his or her profile, the date is included. Learn more about profile update requests. We’ve made the membership card available to access once a member renews membership. If your organization uses the membership card feature, once a member renews, the confirmation email will include a tokenized link to access the member card. Clicking the link will open a new page with the member card and another link to download as a PDF. Learn more about accessing membership cards. We're starting off 2019 with a jam-packed list full of great new features. In response to your feedback and support throughout 2018, five new updates have been released to the platform to better meet the ever-changing needs of our beloved groups. Just like you, we're dynamic too. The all-new All Payments report has an updated look and feel that makes it cleaner and more user friendly. The report provides administrators with a bird’s-eye view of their organization and more detailed way to manage transaction-level data. Admins can easily view and manipulate data – without having to export to Excel (which you can still do, of course). If your organization has child groups, such as chapters or clubs, you can also see and sort transactions from your child groups in the same report. This report and its features are available on all subscription plans. Our most recent update to the member directory features a full library of your organization’s members, their profiles, and their personalized information. Each member’s data is only accessible by your group, and displayed information settings are controlled by individual privacy settings. Request that members showcase their education, career, member level, or group title on their profile, or alternatively allow them to maintain the mystery with as little disclosure possible. Our new polls tool is useful to all organizations by allowing them to facilitate secure, professional voting for officer elections, awards, or other ballot and election-oriented tasks. We offer much more customization and useful features – such as the ability to include more than one question – than polls on social media. Administrators have the flexibility to customize who is qualified to take a poll, start and end times to access the poll, as well as the data displayed in real-time results. The memberplanet participation tracker provides administrators a transparent and accountable way to record or award credit (or points, hours, or any other type of format) to members for their involvement in your activities, such as attending an event, completing study hours, or volunteering their time. This is an excellent tool to recognize and reward active members, monitor overall event attendance or track volunteer hours, and learn which activities are actively engaging your members. Get a headcount ahead of time, generate event buzz by letting guests see who else has RSVP’d, and send tailored messages targeting people on your guest list based on their RSVP response. It’s a great way to promote online event registration and increase operational visibility on the days leading up to your event. Our recent fix includes an option to verify whether the person’s name matches the name on the invite. If it doesn’t, they can log in with their own credentials and continue to RSVP. 2018 was a year full of growth for us; we'll be helping you do the same all 2019. Tell us what you think of our platform, how we can improve our features, or simply say hello at support@memberplanet.com. Let's grow together this year. Our new polls tool is useful to all organizations by allowing them to facilitate secure, professional voting for officer elections, awards, or other ballot and election-oriented tasks. We offer much more customization and useful features – such as the ability to include more than one question – than polls on social media. Administrators have the flexibility to customize who is qualified to take a poll, start and end times to access the poll, as well as the data displayed in real-time results. Learn more and view the full polls documentation. An All Payments report enhancement automatically saves column settings for easier viewing. When viewing all payments, your selection of columns and column order adjustments will be saved. After selecting/deselecting columns or re-ordering columns, a message will briefly appear at the bottom of your browser as a confirmation that your settings have been saved. The next time you view the All Payments report, your saved column settings will apply. Learn more about the All Payments report. Participation tracker provides administrators a transparent and accountable way to record or award credit (or points, hours, or any other type of format) to members for their involvement in your organization’s activities, such as attending an event, completing study hours, or volunteering their time. Data is securely recorded by date and time in a customizable reporting format. You’ll be able to see who received credits and which admin awarded participation, as well as make any edits without navigating away from the report. Learn more and view the full participation tracker documentation. Administrators can enable event check-in to record attendance on the actual day of an event or activity, such as a community outreach, weekly membership meeting, or a study session. Admins can record a check-in by requiring members to use a system-generated passcode or manually checking in attendees. Admins can also customize the start and end times of the check-in window and edit the check-in status of a member. When linked to a participation tracker, admins can award members credits (or points, hours, or any other type of unit) for their check-in. Learn more: How to Enable the Event Check-in Feature. Sometimes guests forward their personalized event invite to their friends. To avoid confusion in reporting when someone RSVPs, an option was added to verify whether the person’s name on the invite matches the person who’s RSVPing. If it doesn’t, the user can log in with their own credentials and continue to RSVP. Learn more about enabling and sharing RSVPs. Our integration with Plaid, a financial technology company, gives users an additional option to easily and securely link a bank account to make a payment. From any type of payment form on memberplanet, when the Pay with Bank option is selected, the user can search for their bank or add their bank manually by following on-screen prompts for a seamless consumer experience. Learn more about viewing your organization’s transaction reports. The new Smart Search feature enhances the member directory and makes it easier for members to find other members by searching any field of data your organization collects. Through the interactive directory, you can give your members networking and mentorship opportunities, foster an online community, and improve engagement. Robust search functionality include returning partial and exact matches, as well as the ability to search custom field data, such as similar interests. Learn more about using Smart Search in the directory. Members may come and go within your group, and one way to encourage those looking to re-join is to not charge them for the payment cycles that passed while they were in lapsed status. Admins can now toggle this collection function on and off, so they have absolute control of the amount a returning member owes. Admins can waive those passed payments or decide to collect every payment from the date they left up to their return date. The choice is yours. Collect wisely. Learn how to enable or disable missed payment collection. The increased flexibility of installment plans for members is a feature that helps groups grow and retain membership. The ability for admins to accurately track and monitor the progress of installment plans as it relates to fundraising goals or membership dues will help you keep your group on target. Learn how to view all your group’s transaction reports, including installment. We’ve kicked off the new year with some fresh tech updates to help make managing your members and growing your group even easier. All through the holidays, we’ve kept busy to enhance event management, improve our member database, and more. You gave us suggestions on how to update the user experience, and we’ve been listening! Check out what’s new and improved. Admins of groups of any size, even those with more than 100,000 members, can now easily download their entire member database. The whole process runs behind the scenes, allowing admins to continue working on the platform without having to pause so the database can download. A notification email is sent to the admin when the download is complete. Learn how to download your member database. To set separate prices for members and non-members, fill in the dollar amounts. We’ve made it even easier for your members or donors to make online payments. When users add a new payment method, they now have the option to add this payment method to any already active recurring payment schedules. This improves the user experience by limiting re-entry of information (because no one wants to update payment info twice), as well as making sure they don’t accidentally miss a payment. We’ve cut down on the number of clicks it takes to download a member’s card from desktop, and membership cards are even easier to access from the mobile app. The next time Jim and Pam show up to an event or meeting without their member cards, simply have them pull up their cards from their smartphone. Learn how to access and download membership cards. We exist to simplify membership management, and for you and your admins, that means simplifying life as a leader. Share your thoughts with us on how we can further improve the customer experience by emailing suggestions@memberplanet.com. Digital membership cards are one of our most used features, and we’ve made them even easier to access! As most members know, cards can be accessed through a desktop or can be downloaded via our mobile app. Admins can now search for a member card by member instead of going through the whole member directory. This will save time accessing member cards for both admins and members at meetings and events. Learn more: How to download membership cards. Need to access your membership card on the go but don’t have Wi-Fi? We’ve got good news -- you can now access your member card offline. Once you download your member card via mobile app, it will automatically save to your phone. Easily access your card, with or without internet! Learn more: How to download membership cards via the mobile app. Recurring payments is an essential set-it-and-forget-it feature for all member-based organizations. When it comes time for your members to renew their membership, they shouldn’t have to think about writing another check or pulling out cash from their wallet. Recurring payments allows for a more frictionless experience. We’ve streamlined our recurring payments functionality to make it easier for users to opt in and select the frequency, as well as stop recurring payments. Installments, which we’ve also streamlined, are a great way to increase your fundraising dollars. Some people are more willing to donate a higher amount if they can pay in installments – and it’s a best practice to always give them the option. Learn more: Manage recurring payments on a Donation Site. Our reporting features are great for keeping a bird’s-eye view on your group and to target and track member activity. With our new membership levels history report, admins can look at the history of each member level. The membership levels report can be found under the membership tab on the left navigation sidebar. On the levels tab, admins can click on the gear icon that corresponds with the membership level they want to view, then select View Members in the dropdown menu. Admins can also level history by member. On the Members tab, select the gear icon next to the member name you wish to see the history for, then select Level History in the dropdown menu. In addition to the member levels report, we’ve added new reports for Member Circles, which serves to give admins a more in-depth look at data collected for each subgroup. The Member Circles feature is an easy way to create a small grouping of individuals in your organization, and is a type of membership level that allows one person to manage the membership account for a group of people (such as a family or company account). Circle Member reports will list each Member Circle by members. 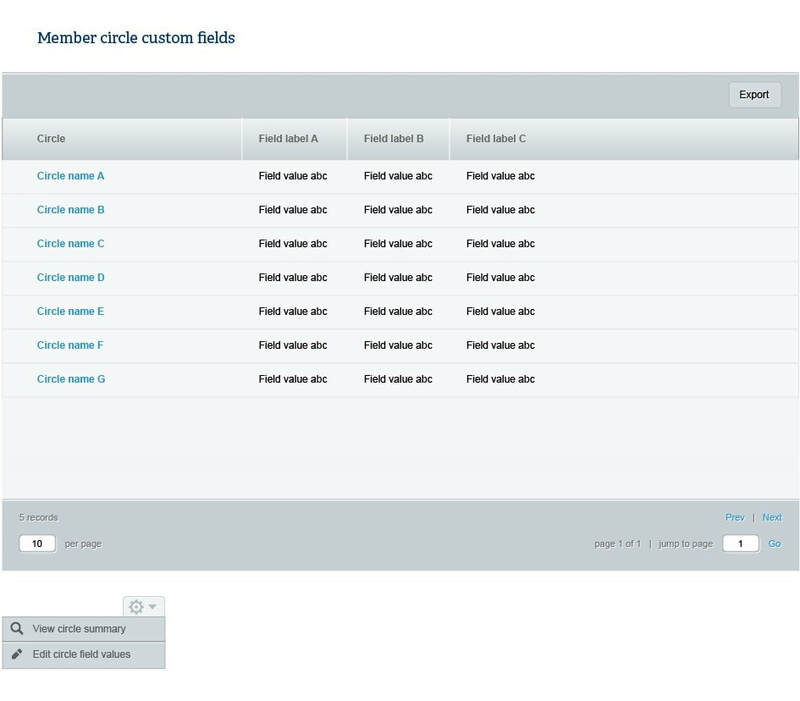 The Member Circle custom fields report allows for the admin to view each response. These reports can be found under the members tab on the left navigation sidebar. Learn more about Member Circles.